My experience of photographing the Ice Grizzlies of the Yukon could very easily read like one of those early childhood ‘what I did in my holidays’ essays. “I got up & then I got on a coach. I went to the airport & flew in a big plane to a place called Vancouver. I got into another, smaller plane & went to Whitehorse. It was snowy & cold. The next day I got in an even smaller plane & went to a place called Dawson City. It was a Sunday; everything was closed. I stayed in a hotel & then we got in a helicopter. Then we saw bears & a wolf. Then we came home”. That’s pretty accurate, albeit over-simplistic. It’s quite an adventure getting to Bear Cave Mountain, but boy is it worth it. 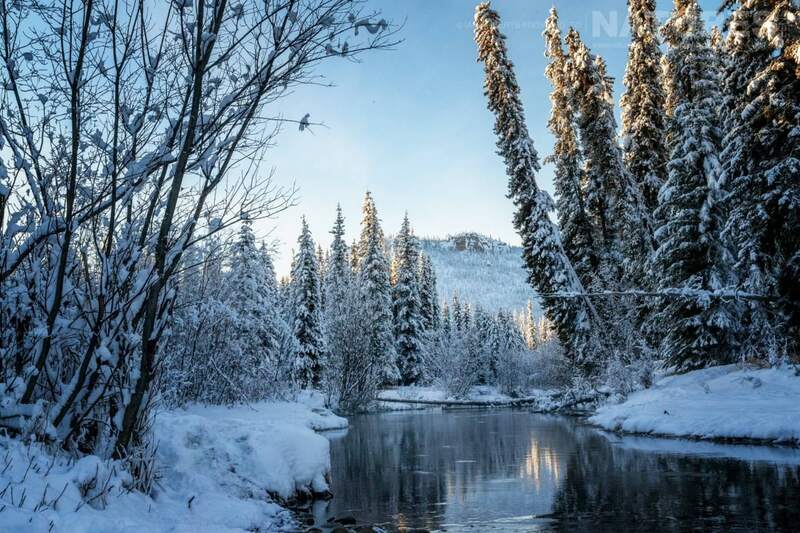 Dawson City is a fascinating mix of history & modern. Many old buildings date from the Gold Rush era, in varying states of upkeep, & the trappings of modern life, but with a very Northern twist. A seasonal city that serves the tourist industry as well as still supporting commercial gold extraction. It was post-season when we were there but it was still fascinating & the people are welcoming. 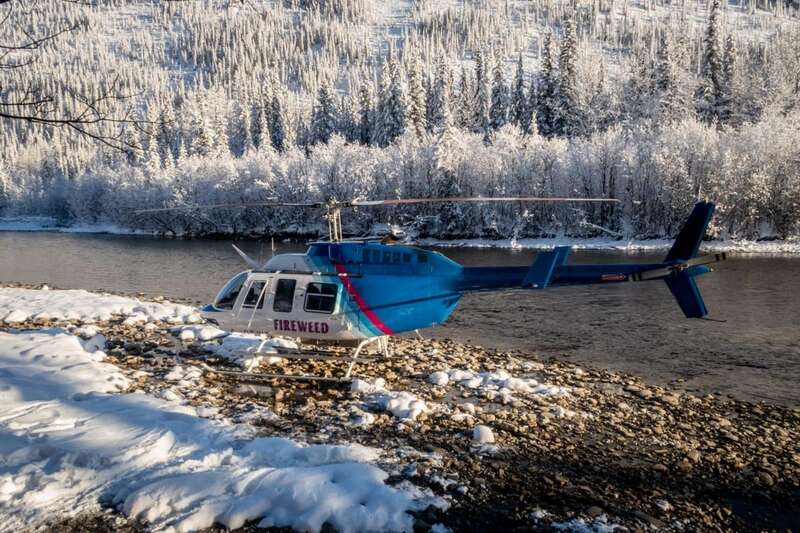 The next stage of the adventure is the helicopter ride — two hours over the starkly majestic tundra & mountains of the Northern Yukon. Challenging & inhospitable doesn’t even start to describe it. The approach to the camp is ‘interesting’. There’s no sign of where the camp is & the pilot just took us down to river level & landed on a shingle ‘beach’. Only then could we see the camp through the trees. Settling in didn’t take long. There are only four buildings & a ‘room with a view’ – more on this later – the main cabin, three two-person sleeping cabins & a loo. 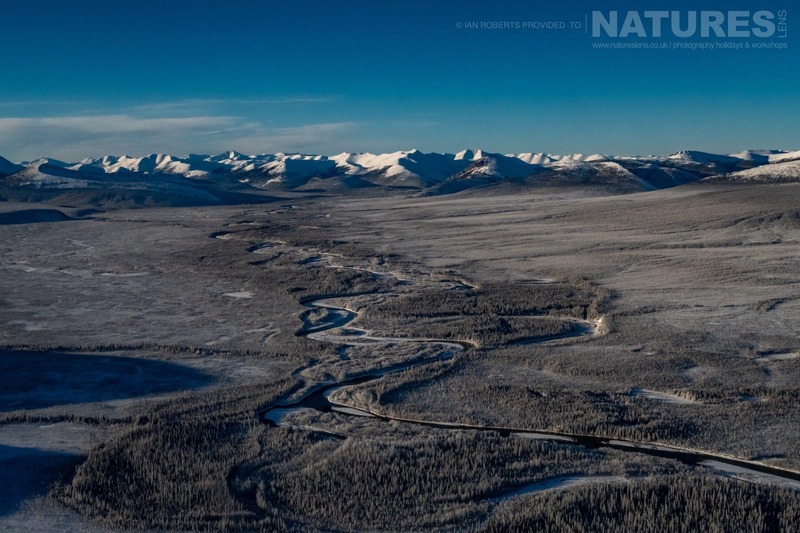 The message from the very point of arrival was that this is grizzly bear country & everywhere was a potential viewing site – yes, even the camp. And that, I suppose, is the key to the success of this place. 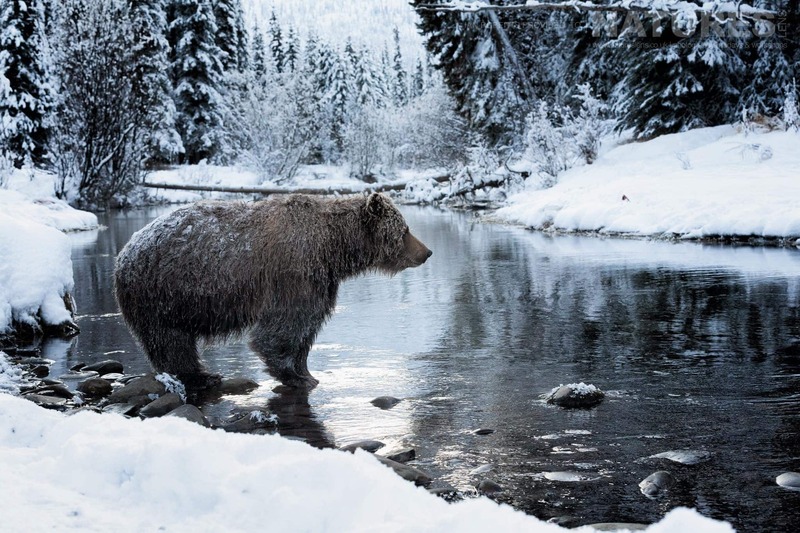 Respect the grizzly bears & their environment & they will reward you. The local guides, Phil & Ross, were quick to induct us into the required behaviour – slow, deliberate movement, no talking unless necessary, & then very quietly. 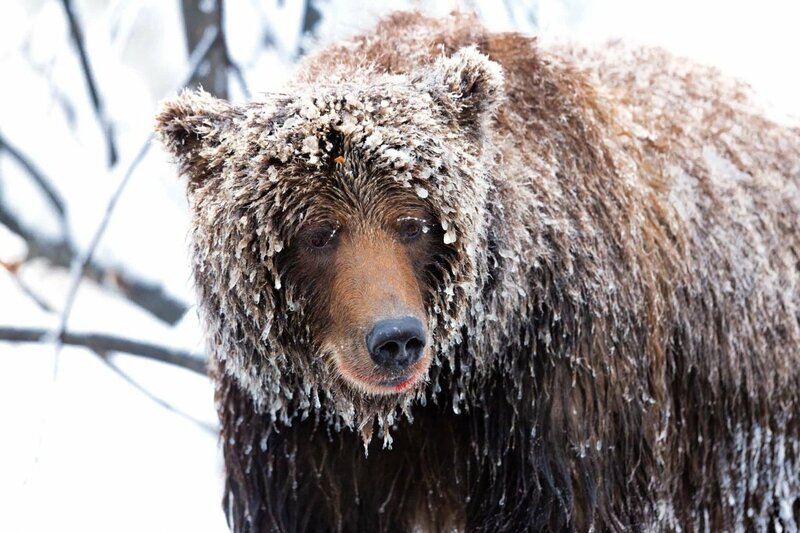 The philosophy is to give the bears nothing – no encouragement, no reward, & no bad experiences of humans. It works. The nights just North of the Arctic Circle were already getting long & we lost several minutes of useable light each day. A home cooked breakfast set us up well for the day & the photography started around 10 am. The temperatures varied from -5 to -20°C during the day but we were blessed with reasonable weather, cloudy & fine, but best of all no wind chill. Nevertheless, the adage ‘there’s no such thing as bad weather, just the wrong clothing’ was borne out, but Bear Cave Mountain Camp provides all the clothing you are likely to need, from boots to insulated outer layers. That said, there’s no denying it was cold. We were guided to a viewing site each day. 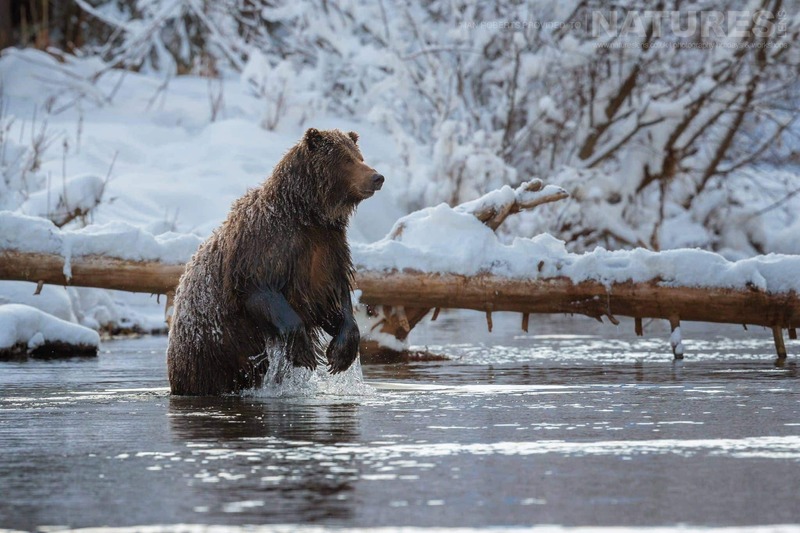 Bear Cave Mountain has several & it is the behaviour of the salmon that determines which. Once at the viewing site, it’s simply a case of setting up your kit, getting as comfortable as you can, & waiting. Seven hours later, it’s the reverse, but hopefully, some grizzly bears or other beasts have shown up in the interim! The frequency of sightings varied but we did not have a ‘dry’ day. Two bears were frequent visitors & they would appear out of the woods but metres from us. That was when the briefings kicked in; breathe deep, act slow, wait for the bear to settle down. Once the bears realise you’re no threat, they get on with hunting the salmon & will happily stand within 5 metres of you as you click away! 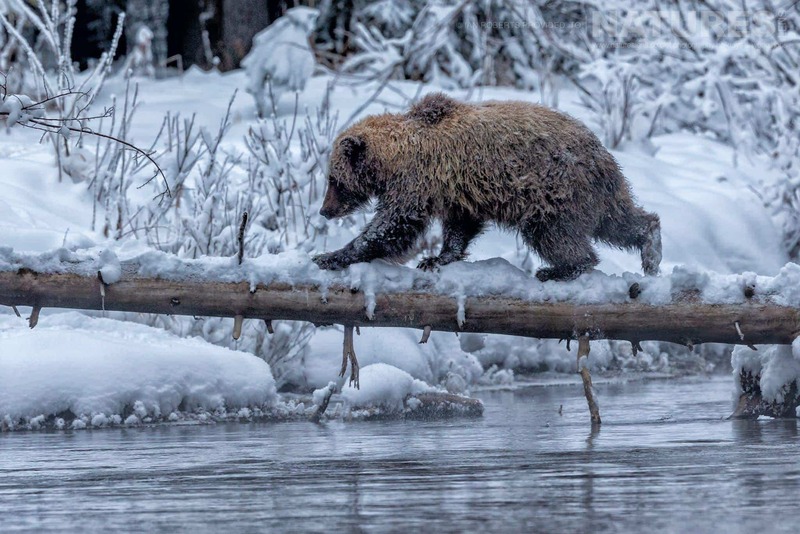 That’s when you know you are in a special place; there is a balance between you, the grizzly bear & nature, & it’s spiritual. 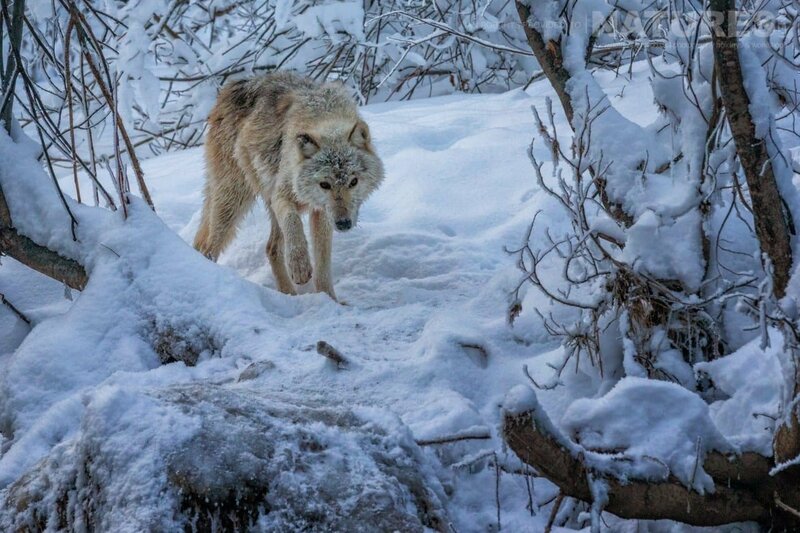 Being privileged to enjoy that proximity to a wild animal is difficult, if not impossible, to describe adequately. It’s just ‘other’ & it was essential periodically to put down the camera & bask in the sensation. It was fascinating to observe the bear’s hunting behaviour. 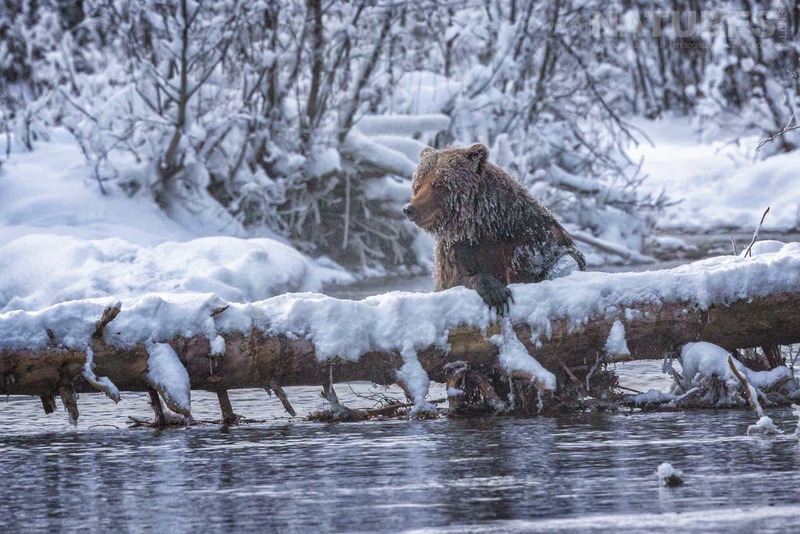 They are intelligent creatures & use a variety of techniques to drive the salmon where they want them. 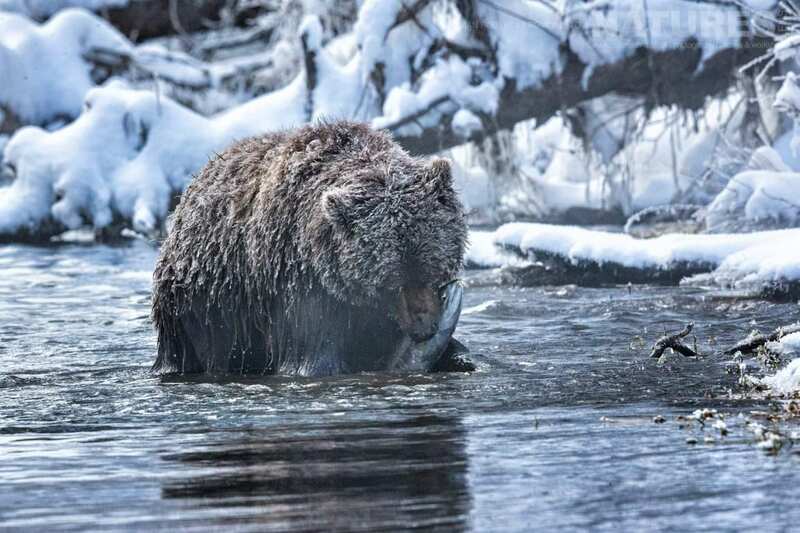 The ice bears may stalk up & down the stream in the water, or patrol the bank, but all the time their heads are swinging from side to side, sizing up the catch. 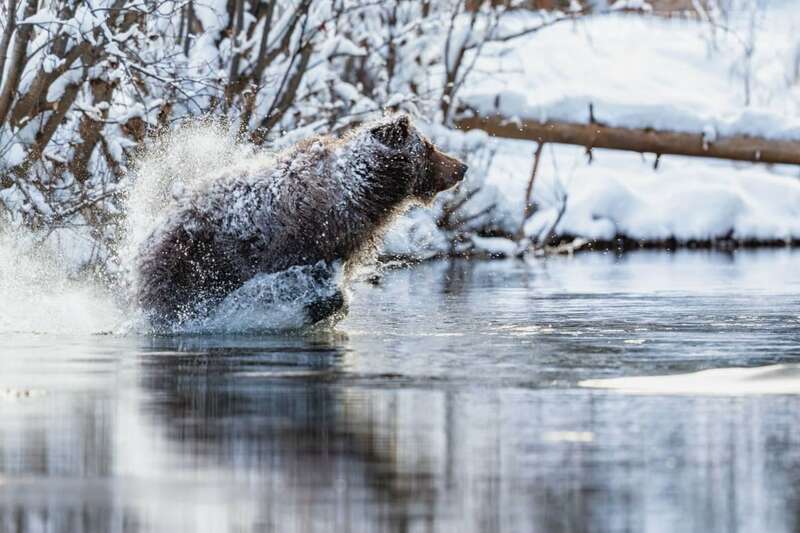 We watched as the bears slapped the water or hit the snow on the bank to disturb the salmon — so many tactics to find the highest value target. The male salmon may be more abundant, but the smaller females are still carrying eggs & have higher food value. 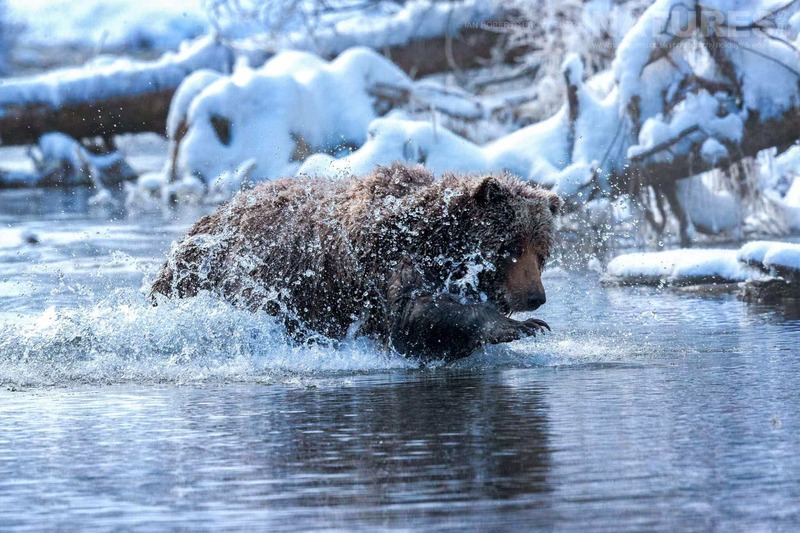 Once they decide, then the chase is on; the bear charges through the water & you can see the salmon scatter, but eventually, the prominent claws strike, then all calms down, the bear’s head dips into the water & comes up with a salmon in their mouth. And that’s how you get an ice bear. With the low temperature, the water freezes on the fur, encrusting their heads with a white corona. In the evenings, there was time for a relaxing beer while downloading images & discussion of the day before a hearty dinner. The camp has a basic shower in the central cabin but, frankly, it was a bit too cold for dancing around déshabillé too often! Our guides lit the wood-burning stove in the sleeping cabin each evening & that took the edge off the temperature when turning in. You also didn’t drink too much in the realisation that a trip to the loo entailed getting dressed before a short trudge through the snow. We had a running joke where a good night’s sleep was judged by the number of ‘excursions’! Nevertheless, it was surprising how well we slept; we were all getting a good 10-11 hours a night. One lesson learned very quickly though was to sleep with your next day’s base layers in bed with you, as the stove didn’t last the night & it was quite ‘brisk’ in the morning! The bears were not the only wildlife. We saw moose tracks but, regrettably, never the animal. Pine martens were frequent visitors at the creek & the woods were full of red squirrels. Ravens were an ever-present observer (& scavenger of salmon) & there was a variety of other bird-life. 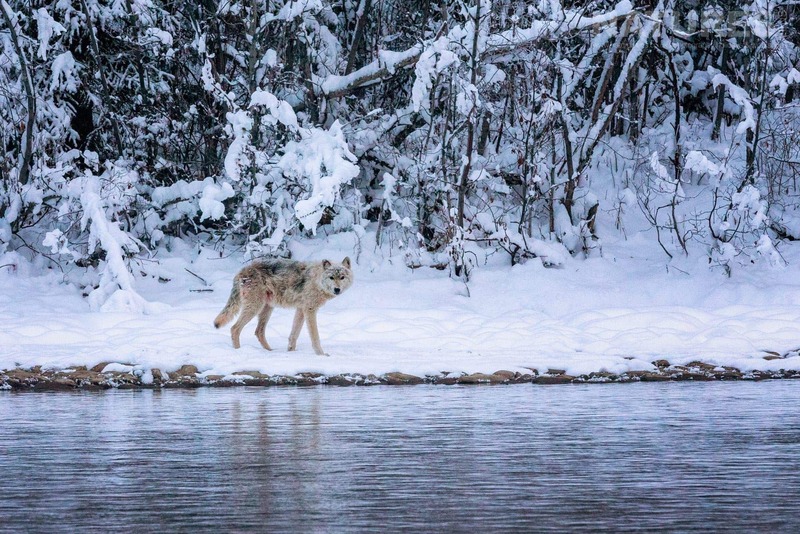 One day, we saw a lone wolf on the other side of the Fishing Branch River. It gave us the stare & wandered on. Some hours later it was back &, having crossed the river, graced us with its presence & proximity for the best part of an hour. The ice bears see the camp as theirs too & that brought an extra little frisson to night hours trips to the loo. Fortunately, no-one experienced the natural laxative! We did see bears in camp during the day. 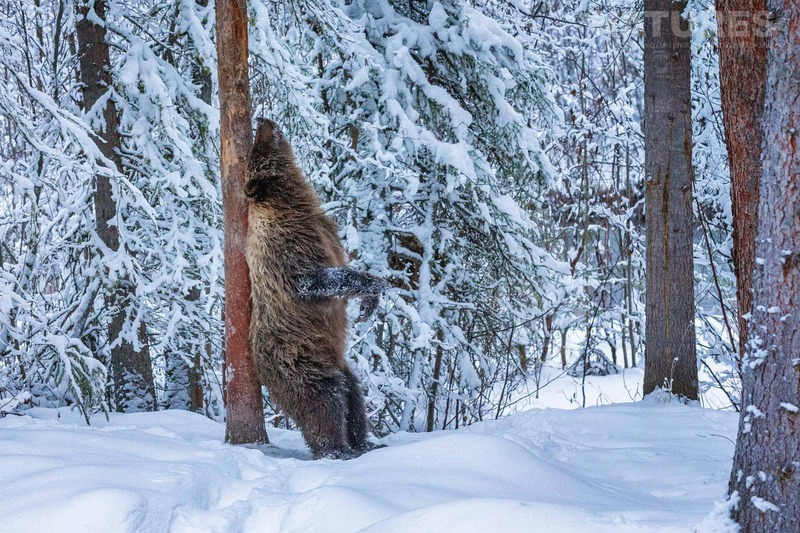 There were two trees in the camp that were favourite bear back-scratching posts & you could almost feel the pleasure the bears experienced – think ‘the bare necessities’. Seven days passed all too quickly & it was with real regret that we heard the helicopter coming to pick us up. 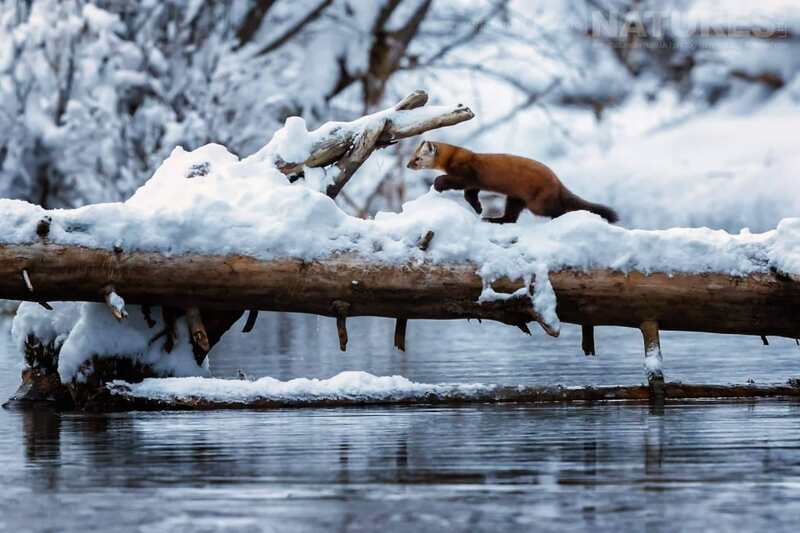 The journey & the conditions were undoubtedly challenging, but the prize was worth it. I felt privileged to have been given the opportunity see grizzly bears up close, wild, & in their natural environment. But the images we brought back will serve to keep those memories alive forever. Once in a lifetime? Perhaps, & that heightens the ‘specialness’. There are only 24 places a year to see the ice bears & bookings are made years in advance. The next NaturesLens trip is in 2023. If there’s still space left, grab it & start saving for the trip of a lifetime. 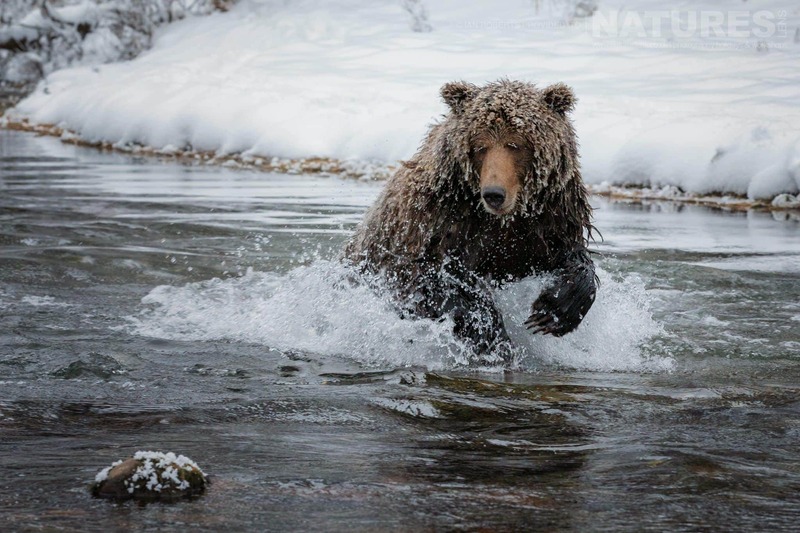 To photograph the Ice Grizzlies of the Yukon for yourself, join David & Pui Hang Miles, the co-founders of NaturesLens, in , Canada during October 2023 for a trip lasting 7 nights; this photography holiday will offer you the opportunity to capture images of the native grizzly bear; the NaturesLens Ice Grizzlies of the Yukon Photography Holiday is offered on a full board, shared room basis, & costs £9999 per participant. 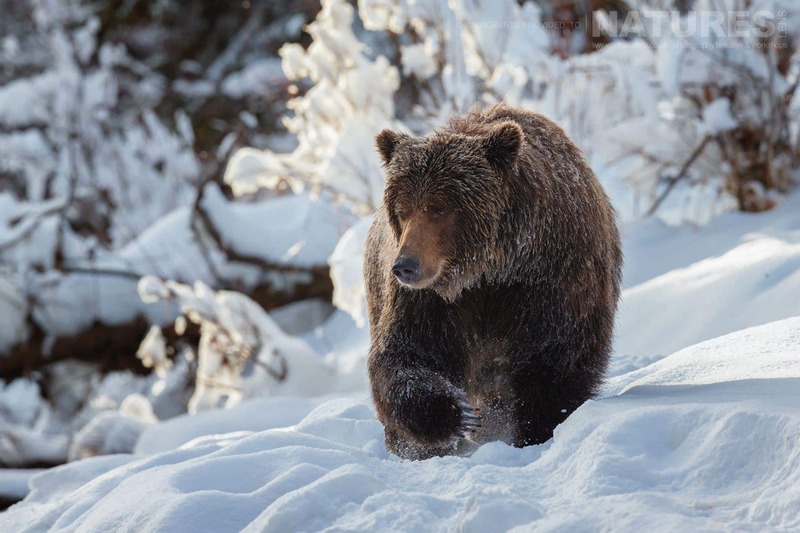 All the details of the Ice Grizzlies of the Yukon Photography Holiday are available on the dedicated event page. 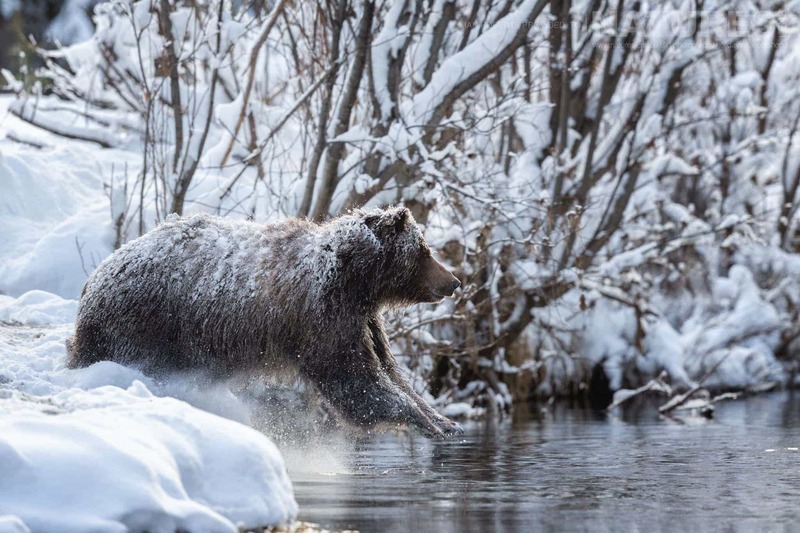 This entry was posted in client images, photography holidays, worldwide tours and tagged grizzly bear, ice, ice grizzlies, photography holiday, snow, winter. Whatever your query regarding our photography holiday, Photographing the Ice Grizzlies of the Yukon, please fill out your details below & we will get back to you.